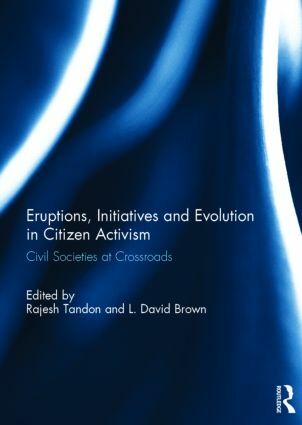 Eruptions, Initiatives and Evolution in Citizen Activism is the result of a collaborative research project spanning Asia, Africa, Latin America, and Europe. The book analyses internal and external challenges to civil society in more than twenty countries. It investigates through studies of ountries that include South Africa, India and the Netherlands of civil society evolution; examinations of citizen activism, such as Occupy London, the Chilean student movement, the Cambodian farmers campaign against land grabs; regional overviews such as the Southern Cone of Latin America, Southern Africa, and Russia. The studies identify changing roles, capacities, contributions and limitations of civil society in response to changing political, economic and social contexts. The book goes on to present selected studies, identifies patterns and lessons that emerge across countries and regions. It articulates implications of those lessons for practitioners and policy makers concerned with civil society contributions to national and regional development. This book was published as a special double issue of Development in Practice. Rajesh Tandon is the founder President of the Society for Participatory Research in Asia (PRIA), an India-based NGO that provides civil society research and capacity building. He has been active in regional and international initiatives to strengthen civil society, democratic governance, and active citizenship. L. David Brown is a retired Senior Research Fellow at the Hauser Center for Nonprofit Organizations at Harvard University. He was co-Founder and President of the Institute for Development Research, a civil society research and capacity-building center in Boston. He works on civil society development, cross-sector collaboration, and transnational civil society organizations. Each title in the Development in Practice Books series offers a focused overview of practice-relevant analysis, experience, and research on key topics in development.